**Wooden Jewelry Armoire Dark Walnut Finish, 8 Drawers, Necklace Doors from allurez. Price: $450.00. Discount: 68%. Categories: Home, Furniture, Jewelry, Armoire, Sponsored. Deal Rating: 5 Stars out of 5. Store Rating: 5 Stars out of 5. Deal Recommendation: Recommended. Available Until: Limited Quantity. 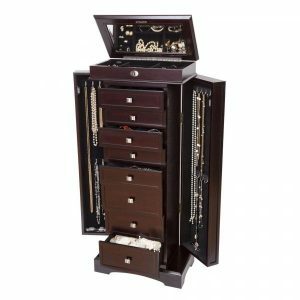 Thoughts: Clearance – Wooden Jewelry Armoire Dark Walnut Finish, 8 Drawers, Necklace Doors. Deal Score: 70 out of 100. **Classic, French Provincial Style Wooden Jewelry Armoire in Java Finish from allurez. Price: $210.00. Discount: 58%. Categories: Home, Furniture, Jewelry, Armoire, Sponsored. Deal Rating: 5 Stars out of 5. Store Rating: 5 Stars out of 5. Deal Recommendation: Recommended. Available Until: Limited Quantity. Thoughts: Clearance – Classic, French Provincial Style Wooden Jewelry Armoire in Java Finish. Deal Score: 70 out of 100. **Women’s Standing Jewelry Armoire w/ Mirror in Mahogany from allurez. Price: $743.00. Discount: 50%. Categories: Home, Furniture, Jewelry, Armoire, Sponsored. Deal Rating: 4.7 Stars out of 5. Store Rating: 5 Stars out of 5. Deal Recommendation: Recommended. Available Until: Limited Quantity. Thoughts: Clearance – Women’s Standing Jewelry Armoire w/ Mirror in Mahogany. Deal Score: 60 out of 100. * Buy One, Get Up To Two 50% Off* from Piercing Pagoda. Price: Not Specified. Discount: 50% OFF. Categories: Fine Jewelry, Sponsored, Necklaces, Bracelets, Pendants. Deal Rating: 5 Stars out of 5. Store Rating: 5 Stars out of 5. Deal Recommendation: Recommended. Available Until: Not Specified. Thoughts: None. * 1/4 CT. T.W. Diamond Solitaire Pendant and Earrings Set in 10K White Gold from Gordon’s Jewelers. Price: $349.30. Discount: $149.70. Categories: Fine Jewelry, Sponsored, Jewelry Sets. Deal Rating: 5 Stars out of 5. Store Rating: 5 Stars out of 5. Deal Recommendation: Recommended. Available Until: Not Specified. Thoughts: None. * Oval Lab-Created Blue and White Sapphire with Diamond Accent Frame Pendant, Ring and Earrings Set in Sterling Silver from People’s Jewellers. Price: $299.99. Discount: $149.01. Categories: Fine Jewelry, Sponsored, Jewelry Sets. Deal Rating: 5 Stars out of 5. Store Rating: 5 Stars out of 5. Deal Recommendation: Recommended. Available Until: Not Specified. Thoughts: None. * Cushion-Cut Lab-Created White Sapphire Pendant, Ring and Earrings Set in Sterling Silver – Size 7 fromGordon’s Jewelers. Price: $129.98. Discount: $69.02. Categories: Fine Jewelry, Sponsored, Jewelry Sets. Deal Rating: 5 Stars out of 5. Store Rating: 5 Stars out of 5. Deal Recommendation: Recommended. Available Until: Not Specified. Thoughts: None. * Save 40% 4.50Ct. Sterling Silver Created Sapphire Double Halo Pendant & Earring Set from Elite Jewels. Price: $149.50. Discount: 40% OFF. Categories: Fine Jewelry, Sponsored, Jewelry Set. Deal Rating: 5 Stars out of 5. Store Rating: 5 Stars out of 5. Deal Recommendation: Recommended. Available Until: Not Specified. Thoughts: None.